Kristina does the Internets: How my fiance tricked me into buying my own engagement present... before we were engaged. How my fiance tricked me into buying my own engagement present... before we were engaged. Here's a little story for your Friday. So about a week before we got engaged, I was looking for a wedding present for my cousin. 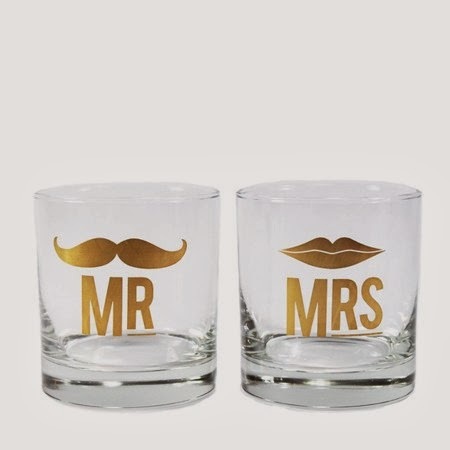 I remembered seeing these adorable Mr. & Mrs. glasses from Furbish Studio. Jeff pointed out that a lot of our friends were getting married/engaged, so maybe we should buy more than one set to give out as presents. I was unsure that we would actually give out more than one, but he was pretty insistent, so I went ahead and placed the order. Turns out Jeff didn't want that extra set to give as a present, he wanted them for us. You know, so he could drink whiskey out of a fancy mustache glass. By the time the glasses came, there was a ring on my finger. Aaaaaaand, self gift. Great title - I had to click right away! Awww that is so cute, and clever! Too funny. Hahaha that is too cute. Gotta respect the creativity! Haha how cute! And the glasses are cool too! Clever, clever fiance. Love the glasses! He's good! :-) Nice glasses.